I’m starting ‘proper’ training this month and it’s hard going. The last 3 months or so I’ve been working on my ‘base’, i.e. losing weight with long, easy-ish rides. Well, it’s only 100 days till l’Etape, so whether or not I’m slim enough I have start thinking about targeted training. So…that means going out a lot harder than I’ve been doing, for one. Last week I did two days of intervals (short sprints one day; 10 min sets the other) and the 2nd one just happened to be the day before my long weekend ride. So here’s the conundrum first. According to the experts, one hard day deserves 24-48 hours of rest (or possibly even more), so you shouldn’t do the same type of ride 2 days in a row. However, you certainly can’t take a day off after every ride or you’ll only have 3 or 4 days a week – unacceptable. It seems to be recommended to take a rest day after a long ‘base’ ride, so that’s what I did (timed perfectly so I could veg on the couch and watch others suffer in the Tour of Flanders!). But as a result, after Friday’s intervals my legs were pretty sore when I jumped on the bike Saturday, making yesterday’s ride tough (or it could be the 5.5 hours I spent in the saddle…). I’m guessing that my organisme, as my French training books calls it, will adapt to this type of training, but if any of you have any tips on how to arrange these rides, you have a willing audience. So, back to yesterday. I decided to go up north where the hills live up to their name, i.e. hilly. 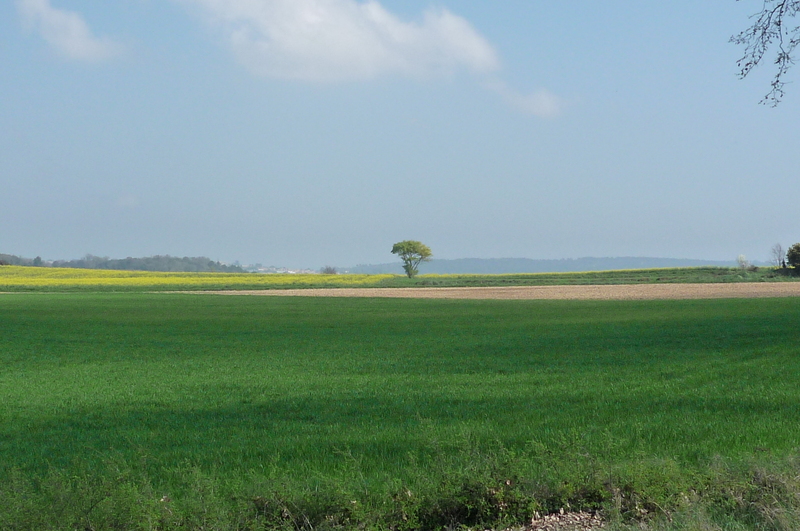 On the way up I had a tail wind and a glorious spring day. I had every intention of taking a bunch of pictures, but yesterday ended up being one of those ‘best laid plans’ sort of ride. I did some random shots, though. 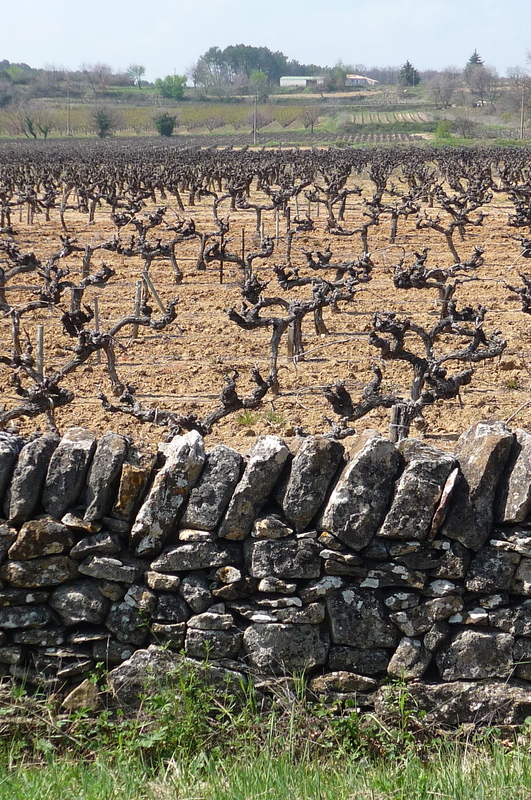 Here are some cut vines ready for spring. Next, the top of one of the many hills I climbed. 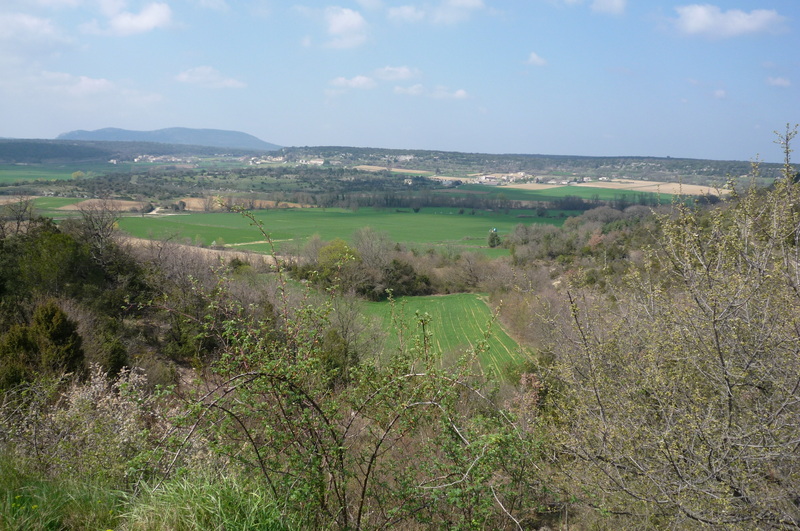 This one is looking north towards the Ardèche department, where my ill-fated 2nd cyclosportive took place last month. 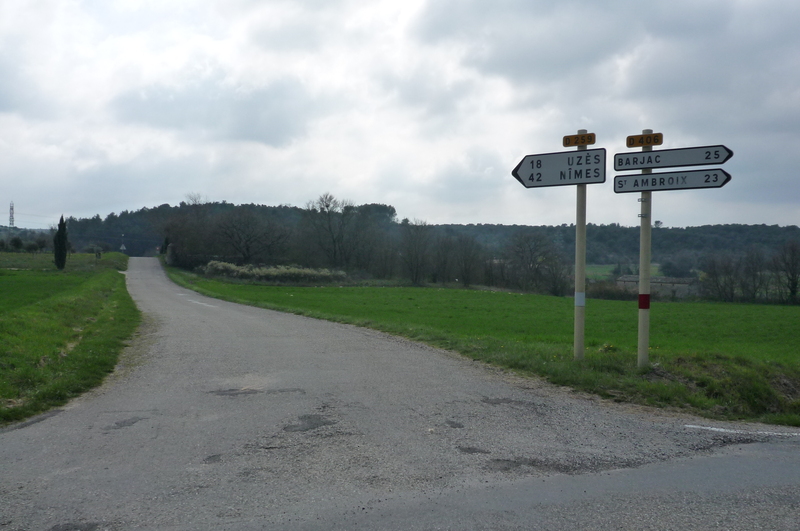 There were LOTS of club riders out today, which always makes me think I’ve chosen the right roads. Here’s a straggler coming up the hill. About 20 others flew by before I could get the camera ready. This is Lussan, a fortified village with a great-looking gîte at the bottom. Would be a great place to stay a week for a cycling vacation. Excellent riding up here. Finally, I turned towards home, and a nasty southerly headwind (that’s what caused the bonk). 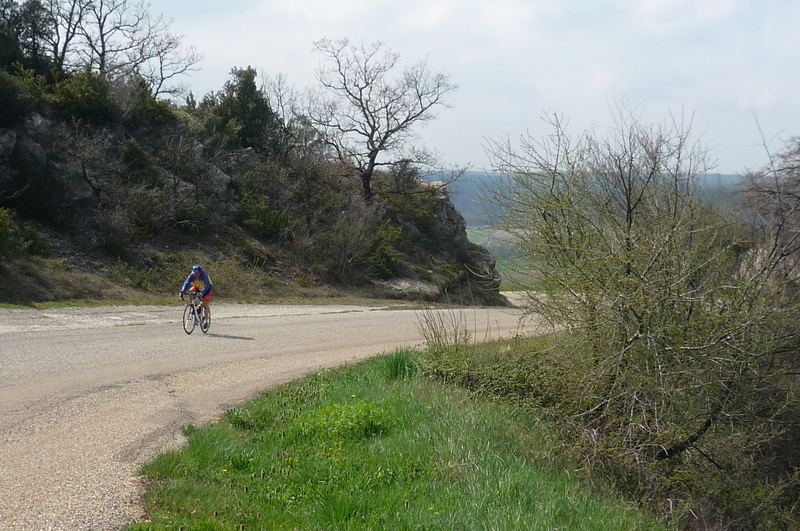 This entry was posted in Cycling and tagged etape training. Bookmark the permalink. Don’t forget to have a quality recovery drink after hard training rides, like Torq Recovery or Evolve Anabolic Injection (I think available in Australia only). It’s 100 days already? Crikey. I’m not even thinking about training yet. I do drink at least a whey protein drink after rides. I’ll look into the ones you mentioned as well. Yep, only 3 more months, mate! I’m guessing you’re in pretty good form anyway, but I think you had ambitious goals for this one.. 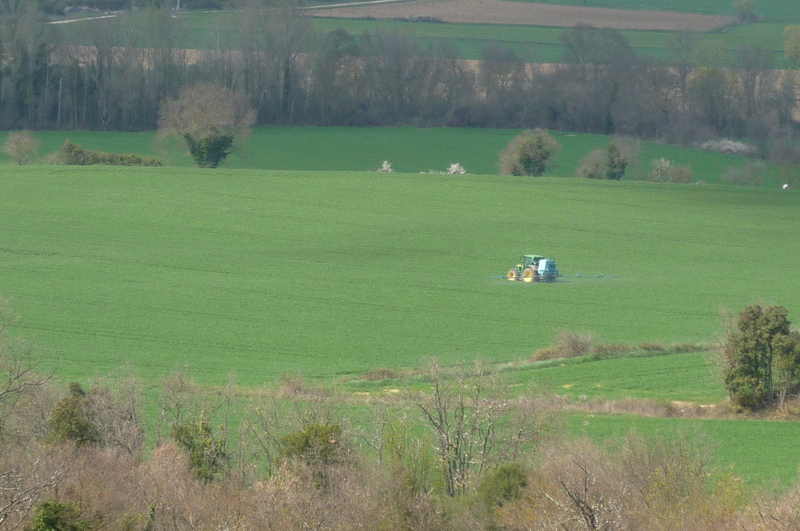 I love those green fields! It makes me think that I will never see snow again as long as I live. Ha! Best of luck on the training. We had south wind ourselves about 40-50 km/hr yesterday and the crosswind was the hardest to deal with. How far away from home, how did it affect you (falling off the bike, etc), and what did you do to overcome it? We all bonk at times, but maybe we all have different ways to deal with that? 24 km from home and I fell right onto the doorstep of a boulangerie…which is how I overcame it. It wasn’t a real bonk, either, but I needed a catchy word to end off the title.